Output for European, US and UK plugs. Its in extremely good condition. 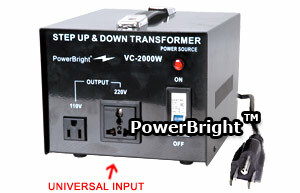 2000 Watts is enough power for just about everything in your home. If you are from the USA, this is a must have if you own numerous electrical items that are at 110 Volts. Also included are the fuses for it as well. It is for sale at 2000 CZK. I am leaving Prague so I don't need it anymore. (If you were to buy it in the USA, its $300 new and easily would cost another $80 just to ship it to Prague from there). Its in Prague 1 for pick up.